July 23, 2015, 5:48 p.m. Planned Parenthood is facing a new controversy over two videos that have emerged showing figures in the organization discussing fees for the provision of parts of aborted fetuses for medical researchers. Planned Parenthood has said that the videos are misleading and deceptive for portraying the legal transfer of fetal tissue as profiteering but anti-abortion activists have seized on the videos as proof of the organization&apos;s immorality. YouGov&apos;s latest research shows that most Americans (52%) continue to have favorable opinion of the women&apos;s health group while 30% have an unfavorable view. The recent video scandal has not yet caused any significant shift in popular opinion of Planned Parenthood. 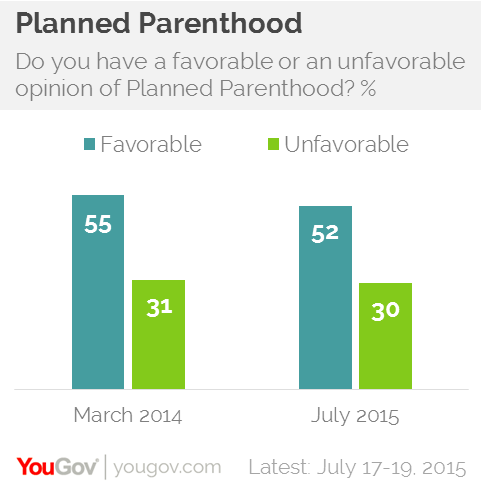 In March 2014 55% of Americans had a favorable opinion of Planned Parenthood while 31% had an unfavorable opinion. Support for Planned Parenthood is highest among Democrats (76%) and people in the Northeast (64%). 52% of Republicans have a negative opinion of the women&apos;s health group though 28% do have a positive opinion of Planned Parenthood. Americans remain very evenly divided on the legality of abortion. 46% of Americans think abortion should &apos;always&apos; or &apos;generally&apos; be legal while 47% think it should &apos;always&apos; or &apos;generally&apos; be illegal. Only 7% of Americans aren&apos;t sure either way. Americans who are pro-choice also tend to have favorable opinions of Planned Parenthood while opinion among people who oppose abortion is more divided. 74% of Americans who say that abortion should always be legal have a favorable opinion of Planned Parenthood, along with 69% of Americans who think abortion should generally be legal. 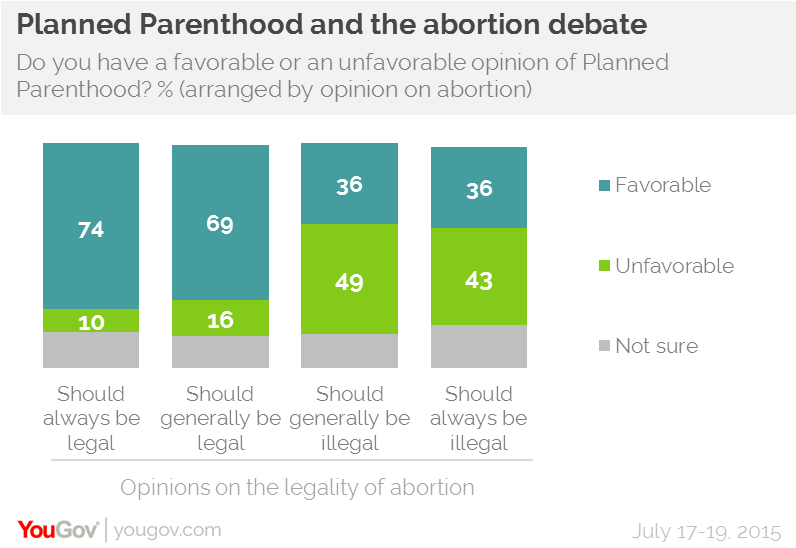 36% of Americans who tend to support strict restrictions on abortion also have a favorable opinion of the group, however, though people who support a general ban (49%) or total ban (43%) tend to have an unfavorable opinion of the group. While the country is divided on the issue of abortion, one side is far more concerned with abortion than the other. 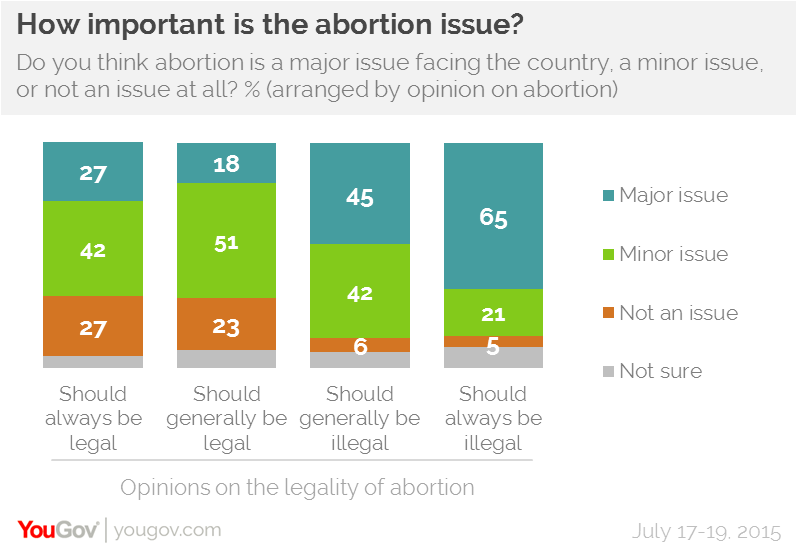 65% of people who think abortion should always be illegal describe abortion as a &apos;major issue&apos; facing the country, compared to only 27% of people who think abortion should always be legal.